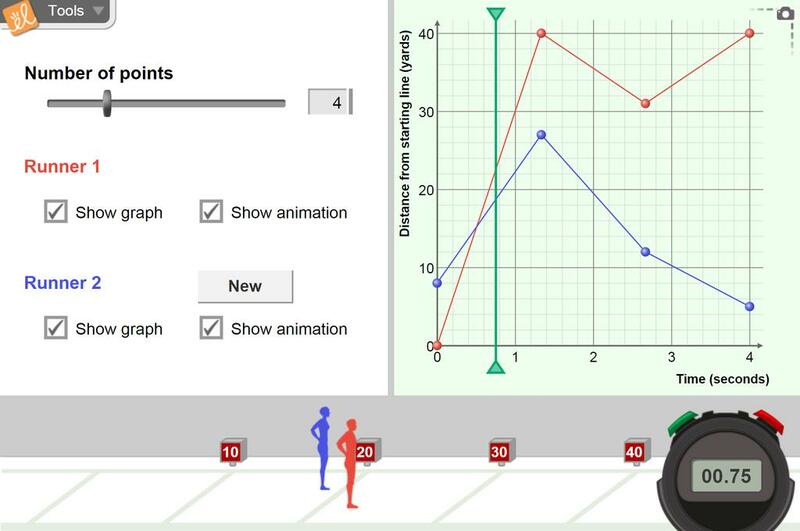 Create a graph of a runner's position versus time and watch the runner complete a 40-yard dash based on the graph you made. Notice the connection between the slope of the line and the speed of the runner. What will the runner do if the slope of the line is zero? What if the slope is negative? Add a second runner (a second graph) and connect real-world meaning to the intersection of two graphs. I use the attached assignment to assess whether my 8th grade students can apply the patterns observed to ... (more)a unique situation. I used the screen shot tool and simple scenarios to see if students could match them up to see if they ha... (more)d an understanding of the Distance Time Graphs. I have used this as a follow-up activity when we begin discussing slope and intercepts and the appropriat... (more)e slope-intercept form. A couple of questions to complete after or during the Gizmo. Great for real-world connections to rates of change and the relationship of change over time and slope. One of the best computer lab simulations that I have used with my students to introduce motion graphs! This Gizmo does a great job of showing the relationship between distance, time and speed-it will be especially helpful for review. This is a great Gizmo to consolidate so many of the Ontario grade 9 expectations. The two representations together is fantastic. Great gizmo to teach motion in my force and motion unit. The kids can look at a graph now and describe what is happening. A classic! Really good for developing graph sense. Your kids will enjoy this Gizmo, and truly grasp the concept. I use this Gizmo at the beginning of every school year to introduce my students to Gizmos and get them hooked right away!